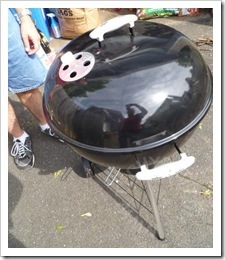 Last year, I won a Weber Grill and grilling utensil set during a Twitter party. 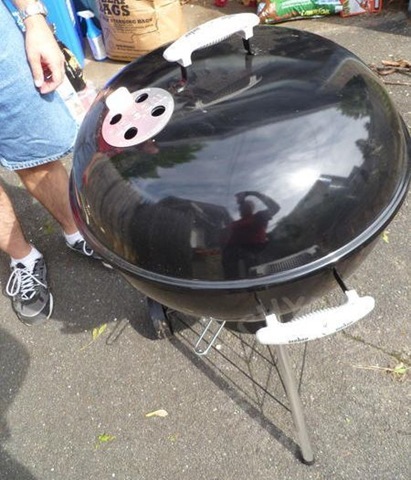 The grill arrived and I hastily assembled it. If by “hastily” you mean “let it sit in the box in our living room for a month and only put it together and took it out because B was going to kill me.” With the grill all set up, I proceeded to not use it. For one reason or another, I just didn’t get to use it during the rest of the summer or fall. Winter came and away the grill went. With spring here, I decided that we should grill. I remembered that the instructions had said to heat the grill for one hour prior to first use. Unfortunately, this meant that I couldn’t use the grill during the week. (Waiting an hour and *then* cooking time seemed excessive.) Weekends were perfect, but it seemed like every day brought rain. No way was I going to be standing over the grill with an umbrella! Finally, this past Sunday, we had nice weather. B went to the store to get some hot dogs and hamburgers. 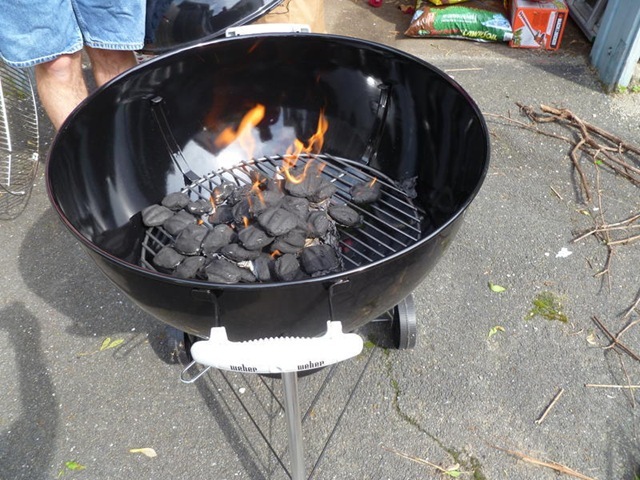 When she got back, I went out, put some charcoal in the grill and tried to light it. Sadly, the wind quickly put out any flame I lit. Undaunted, I recalled a trick about using newspaper. So I got a single sheet of newspaper, arranged it among the charcoal and lit the paper. Sure enough, I got a nice, big flame. I also got pieces of paper shooting off. Too late, I noticed some vines (waiting to be bagged) that had potential for catching on fire. The hose was close, but not on. Fail #1. Luckily, nothing caught on fire, but lesson learned. Next time, I’ll turn the hose on before I light the grill to cut down on any fire extinguishing delay. The next fail came soon after. I had the grill all ready now and going nicely. 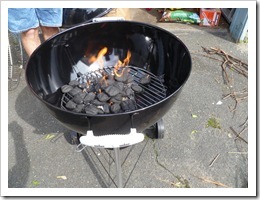 I began to picture the hamburgers and hot dogs on there cooking away with me flipping them using… uh oh. Where were my utensils. During the winter, we put the utensils away. For the life of us, though, we couldn’t remember where. Taking turns (as we weren’t comfortable leaving the grill unattended), we looked and looked to no avail. The utensils *are* in our house. Somewhere. But “somewhere” doesn’t help me flip burgers. Fail #2. It was too late to go out and buy new utensils, so I let the grill burn for the hour, snuffed the flames and put the grill away (after it cooled down). The next day, I looked into some new utensils. On the way home, I bought a new spatula, tongs, and grill brush from Lowe’s. Tomorrow’s weather is looking good so here’s hoping that My First Grilling Take Two is more successful than Take One was. Don’t forget to enter my Dinosaur Train giveaway. You could win Dino Poop and Hatchers.